Lenovo's ThinkCentre M90z all-in-one touchscreen PC is designed primarily for business users. The multitouch touchscreen uses optical technology and it had excellent accuracy during our tests -- you can even use it while wearing gloves. However, the overall configuration of the PC is a bit of a letdown considering its price. Lenovo's ThinkCentre M90z is a 23in, all-in-one multi-touch touchscreen PC that's aimed at enterprise business users (unlike HP's TouchSmart PCs which are designed for home users). It doesn't look fancy, nor does it have a customised touchscreen interface (it ships with Windows 7 plus a utility called SimpleTap), but it has a decent amount of power under the hood and is suitable for running everyday office and multimedia applications. For the business environment, the M90z's all-in-one form factor and tool-less case are drawcards, but it's unclear how the touchscreen can be used to improve efficiency unless touchscreen-optimised applications are used. The touchscreen uses optical technology; any type of object can make the cursor move. Even a lens cleaning cloth brushing up against the screen will cause the pointer to move or a gesture to be performed. This occurs because there are tiny cameras positioned at the corners of the screen's bezel that can triangulate the position of an object touching the screen. With this technology, you can either use your finger or a rounded pen to navigate the screen. If you're eccentric (or work as a production editor for PC World), you could even use a strut from a broken umbrella. During our tests, touch commands and gestures were spot on (and on par with other touchscreens we've seen, such as HP's Compaq L2105tm touchscreen monitor, although we found that the zooming gesture in photos and Web pages was far too sensitive. To scroll Web pages and long documents you can use a one-finger gesture or a flick — it's similar to how you would do it on an iPhone. The native resolution of the M90z is 1980x1080, which means Windows 7's default interface and Web pages can at times be hard to navigate. For example, if you have thick fingers, a tap intended for one Start menu program will often get the object next to it. But for the most part, the responsiveness of the screen is excellent and we were able to easily drag files and folders and launch applications from the Start menu without making too many mistakes. Handwriting was also recognised correctly most of the time, but it was uncomfortable to write on the screen. The release mechanism for the tool-less case. Overall though, navigating the system with your fingers is not efficient and we foresee that most users will still take solace in the fact that the M90z ships with a keyboard and mouse. Unless you use applications that can benefit from a touch interface, using a touchscreen PC for standard office work seems like a waste of capabilities. We can envision the M90z being used as a touchscreen in an environment where workers wear gloves, for example, as the optical touchscreen technology will recognise the input even if gloves are worn. Perhaps the most pleasure we derived from the M90z was playing the Microsoft Blackboard game (which is part of the Microsoft Touch Pack for Windows 7) during our lunch breaks. Not only was it a nice break from the rigours of normal Test Centre work, but by manipulating the on-screen objects we were able to see exactly how sensitive and accurate the screen is. We were impressed — in fact, we're quite sad this unit has to go back to Lenovo as we've gotten so used to having it in our Test Centre. Behind the screen is where the PC's components sit and it has a configuration that's adequate for a typical office, but not spectacular. The PC's Intel Core i5-650 CPU has two CPU cores and Hyper-Threading, so it can process four threads at once, which makes it useful for multitasking and processing multithreaded applications. In our Blender 3D rendering and MP3 iTunes encoding tests, the M90z recorded times of 48sec and 70sec respectively. This is slightly slower than what the Dell Studio XPS 8100 (which has the same CPU) recorded in the same tests, but that PC also has a better supporting cast. The memory, hard drive and graphics departments in the M90z are below par (even by the standards of many business PC currently on the market), with only 2GB of RAM, a 320GB hard drive and Intel GMA HD graphics included. Considering the PC costs over $2400, we would have liked at least 4GB of RAM, a better 3D graphics option and a 500GB hard drive. That said, the responsiveness of the M90z was good when we were multitasking with Web, office and media player applications — and while using the touchscreen to perform gestures in the Web and office applications. The small hard drive is a subjective issue, but we feel that with storage being so cheap, a bigger hard drive should be included for the price — but then, this will also depend on your workplace's backup strategy and a smaller hard drive might be even more desirable. 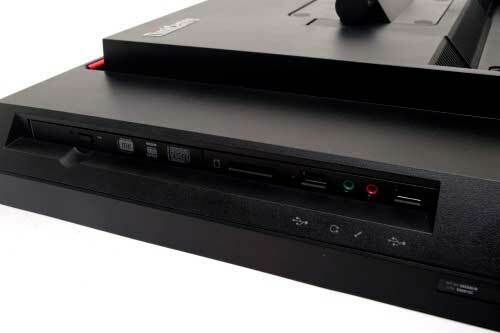 The DVD burner, SD card slot, USB and audio ports on the right side of the unit. As for functionality, the M90z has most of the things we'd look for in a business PC: plenty of USB 2.0 ports (four), Gigabit Ethernet, a built-in DVD burner and an SD card reader. The problem is, everything is hard to reach. 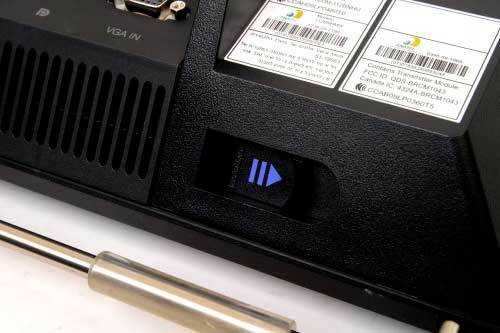 If you use the DVD burner and the SD card slot regularly (as we do in our line of work), then you'll constantly be leaning over the right side of the unit to access them. Over time you could probably get by on feel alone. 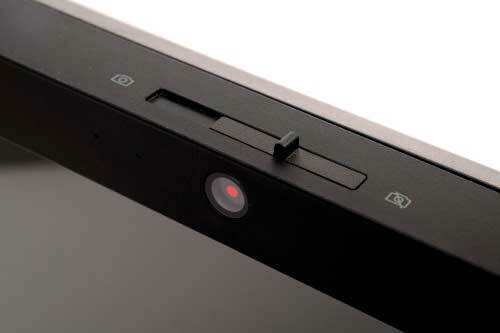 We'd prefer the DVD and SD cards slots to be right on the edge of the screen, rather then recessed behind it. The webcam has a physical slider so that you can block it if you won't be using it. 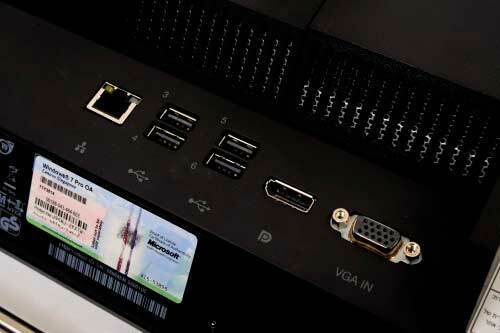 At the back, the M90z also has DisplayPort and VGA ports, so you could use it in a dual-monitor setup. A webcam is installed — it has a physical slider on it so that you can block it off if you don't want it to be used — and 802.11n wireless networking and Bluetooth (which are both optional ). The array of ports on the rear of the M90z. A variety of stands is available for the M90z, but we looked at the most basic option, which makes the PC sit on your desk like a picture frame. A height-adjustable stand is also available. The overall configuration of the ThinkCentre M90z may not be spectacular, but its screen definitely is and we're fans. It may not be something we could use for work purposes just yet, but we could get used to rotating and zooming photos with our fingers.